What Temperature Should I Set for My Water Heater? Your home’s water heater has a maximum temperature setting that controls how hot the water in your faucets may be at any given time. While most of us don’t think about this setting being customizable, it is actually something you can control. A new water heater is typically preset to a maximum temperature of 140 degrees Fahrenheit. Some say that’s the ideal temperature, while others argue that it’s better to reduce the maximum temperature to 120. It’s better for the environment. It takes electrical or gas energy not only to heat your water, but to maintain the water in the storage tank at that temperature (so you have hot water on demand). Decreasing the temperature by 20 degrees significantly reduces the amount of energy required. It saves you money. The energy savings are not only better for the environment, but for your wallet, potentially saving you up to $60 a year. It prevents mineral buildup. Cooler water is less likely to deposit minerals in your pipes, minimizing issues caused by hard water and keeping your water flow unobstructed. It prevents dangerous scalding. This is arguably the argument that outweighs the rest. 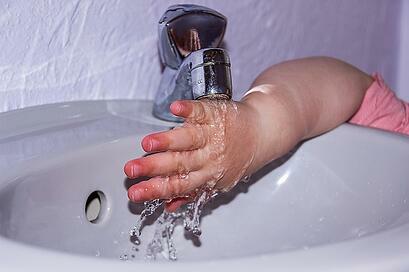 Water coming out of the faucet at 140 degrees can cause serious burns within two or three seconds. By contrast, it takes a minute or two of exposure to 120 degree water before the skin burns. Young children and elderly people are more sensitive to burns on their skin, and for them scalding can be fatal. Given the risk of scalding, why would anyone recommend a higher temperature? Well, actually, 140 degrees is declared safer by another government agency—the Occupational Safety and Health Administration, or OSHA. The main concern has to do with killing a specific strain of bacteria. Most homeowners will not need to worry about this, since water at 120 degrees will eliminate most common bacteria. However, 140 degrees is needed to kill a rare and specific strain, Legionnaires' disease bacteria, which causes a very serious pneumonia-like sickness. Risk factors for LDB bacteria include older water systems with rusty pipes or a water storage system that allows water to stagnate outdoors or for long periods of time. Most households can turn the temperature down to 120 degrees without risk. If you share a home with toddlers or older relatives, the danger of scalding is much, much more serious than any rare strain of bacteria. However, you’ll want to keep your temperature higher if you’ve been notified that your water supply is prone to LDB bacteria, or if you have an older system with stagnating water. It’s also important to keep the temperature higher if you have a sensitive or compromised immune system. If you face the risk of bacteria and have especially young or old family members, the best course of action is probably to keep the temperature at 140—and install an anti-scald device. Once you decide which temperature is better for your household, you’ll need to go about changing it. First, determine what temperature your water currently runs. This step is as simple as letting the water from your faucet run hot, filling a glass, and using a kitchen thermometer to determine its temperature. If you decide you need to adjust the temperature, you may need to consult your water heater’s manual to find out where the temperature setting is. In some cases you’ll find more than one control, which may be hidden behind panels. If you run into problems with adjusting your water heater setting or discover a leak or another problem, a technician from Ken’s would be glad to help you out. Give us a call at (864) 242-5511 any time of the day or night for service.